Throughout the day, are you checking your breath a lot and confused why it never seems fresh? Does your breath begin to smell foul within moments of brushing your teeth and using mouthwash? Odds are, there is something going on beneath the surface (literally) that takes diagnosis and treatment from an experienced dentist in Columbus, OH. When you have chronic bad breath, read on to learn more about the causes, what treatments may help, and how to avoid having bad breath. Bad breath is also known as halitosis. This common dental condition can affect anyone at any time for any number of reasons. It is estimated that at one time or another, more than half of adults in America suffer from bad breath. While it can hurt your self-esteem to be concerned about your bad breath, the good news is it's often easy to treat. Most cases of halitosis are caused by plaque and tartar buildup. The bacteria lets off a bad odor that smells like sulphur. DRY MOUTH: Some drugs can result in bad breath because they cause dry mouth. If your medication gives you dry mouth, try to keep it moist with water and mouthwash. BUILDUP AND BACTERIA: One of the most common cause of bad breath is buildup caused by food particles becoming trapped in your teeth. When the bacteria isn't brushed off regularly, it begins to cause an odor. SMOKING OR USING TOBACCO: Tobacco products are known to cause an unpleasant odor in the mouth. People who use tobacco products are also at greater risk for gum disease, which can make halitosis worse. CERTAIN FOODS: Some foods, such as onion, garlic, and spices, can cause bad breath. This is short-lived and will generally fade on its own once you've brushed and flossed. 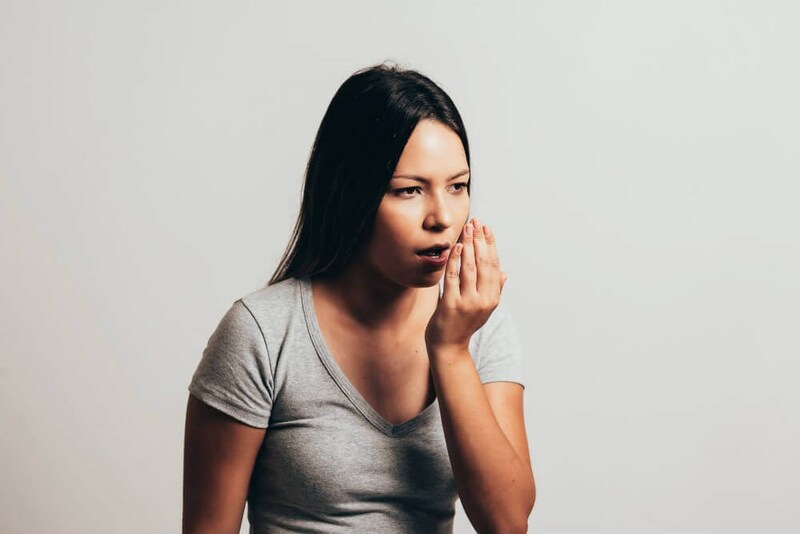 When you have awful breath that is not getting better after changing your oral hygiene and lifestyle, then you may need to schedule an appointment with your dentist. Daily changes, such as brushing more regularly, flossing daily, and drinking lots of water should get rid of your halitosis. If it does not, it could be an indication that something serious is going on. If your dentist feels as though your bad breath is not caused by a dental problem, they can refer you to a primary care physician in Columbus, OH for treatment. Generally, bad breath is easily fixed by a skilled dentist in Columbus, OH. In some circumstances, it might be a symptom that something more serious is occurring, like tooth decay, gum problems, kidney disease, or diabetes. During your appointment to discuss your concerns about your breath, you will likely need a comprehensive oral examination, including digital images. Your dentist can ask you about your medical history to determine the cause of your halitosis. The appointment will likely end with comprehensive instructions on caring for your mouth to reduce buildup and treat your halitosis. One simple way to take care of bad breath, help avoid cavities, and decrease your risk of gum problems, is to consistently practice good oral hygiene. If this does not improve your bad breath, further treatment may be necessary, depending on the cause. For causes related to oral health, your dentist will talk to you about tips and products to help you control the cause. This could include special mouthwash and toothpastes. In the event the halitosis is related to a buildup of plaque and bacteria on your teeth, your dentist may recommend a deep cleaning along with the use of an antiseptic toothpaste and mouthwash. This will kill bacteria and keep it from building up on your teeth in the future. If your bad breath is the result of gingivitis, the first stage of gum disease, your dentist may recommend a special treatment. Gum (periodontal) disease is a progressive condition that may lead to receding gums plus tooth and bone loss. Scaling and root planing therapy plus antibiotics could save your mouth from further damage while freshening your breath. There are several methods to help you prevent bad breath, buildup, in addition to gum disease. The simplest of which is to brush your teeth at least twice a day. More often whenever you eat foods that could become trapped in your teeth. Keep a toothbrush at your office or in your purse for convenience. An antibacterial toothpaste has been shown to reduce and prevent halitosis. Another easy fix is to floss your teeth at least once every day. Flossing removes debris, plaque, and tartar from spots that you cannot see, helping to prevent bacteria from developing. Brushing your tongue can also help reduce bad breath because it could harbor bacteria, especially in people who have chronic dry mouth caused by medication as well as smokers. Also, keep your mouth from getting dry throughout the day. Plain water is the best choice as drinks like soda and coffee can cause a drier mouth. Chewing sugar-free gum can also help by stimulating the production of saliva. Adjust your diet to avoid foods, such as onions and garlic that can give you temporary halitosis. Finally, be sure to maintain twice yearly checkups and cleanings with a dentist in Columbus, OH to keep your breath fresh and your mouth healthy. If you're concerned about chronic bad breath, talk to your dentist about possible underlying causes and treatment options. At DentalWorks - Easton, our experienced team performs oral health exams to diagnosis and treat halitosis for patients of all ages. We're proud to help all of your patients in Columbus, OH so they can enjoy fresher breath and a healthier smile with preventive oral health care as well as advanced treatments. Get in touch with our office in Columbus, OH to schedule your consultation.